SEA OF BURGUNDY - Fall is coming over there, but don't forget that we have Puncak etc etc kinda cold places here, so we still need a bunch of fall collection and now how about the color for fall?. Black? absolutely, Grey? check, brown? ok and please do not NEON, it will scare people around you, ya perhaps. 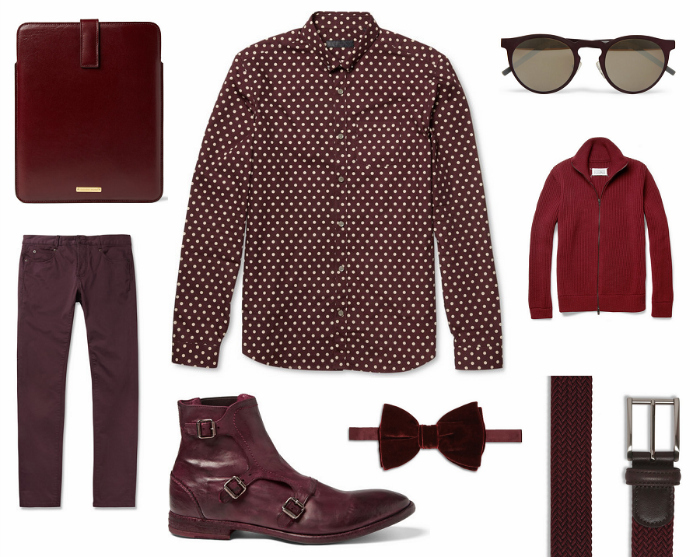 So it always fun to see what's coming up, and realized that fashion always dinamic is more more fun, and now Mr.Porter present to you this rich burgundy to boost up your fall look. I have to say that Burberry Polkadot Shirt is my perfect favorite, swear to God we need that Alexander McQueen Leather Monk-Straps Boots & Ipad Case, I will not suggest you to wear head to toe burgundy, but it will always remain rich and vintage (for darker burgundy). Moreover Lanvin Velvet Bow Tie, Alexander McQueen Brushed Cotton Blend Jeans, Maison Martin Margiela Wool Cardigan, Anderson's Elasticated Woven Belt, Illesteva Sunglasses, they are all, at least will save your fall look. thanks lynette, visit us again next time.